August 17, 2016 — Her face shaded by a wide-brimmed straw hat, Olawumi Benedict is cheerfully tending to her “little babies” — kale seedlings growing in shallow wooden flats until they’re hardy enough for transplantation into soil beds. 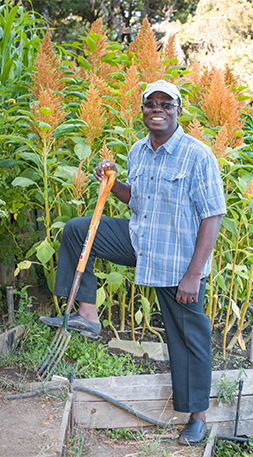 Three miles over the hills on another small farm, Jonnes Mlegwah is double-digging the soil with a spading fork, preparing to plant potatoes. Both are Africans, but these mini-farms are 140 miles north of San Francisco in Mendocino County, better known for the harvesting of redwood trees and marijuana plants than kale and potatoes. Biointensive farms use 50 to 75 percent less land and 94 to 99 percent less energy to produce a given amount of food than does conventional farming.Research shows that biointensive farms use 50 to 75 percent less land, 50 to 100 percent less fertilizer, 67 to 88 percent less water and 94 to 99 percent less energy to produce a given amount of food than does conventional farming. Perhaps most intriguingly, biointensive methods “grow” farmable soil — at a rate 60 times faster than occurs in nature — while traditional farming methods tend to deplete farmable soil through wind and water erosion. Much of the credit for biointensive’s global impact goes to Ecology Action, which has brought Benedict, Mlegwah and about 100 other interns and apprentices to California mini-farms for internships since 2001. Headed by organic gardening pioneer John Jeavons in 1971 and funded by foundations and donations, the nonprofit teaches biointensive farming at three Mendocino County locations to agriculture activists and researchers from around the world who conduct research and then go on to teach others. 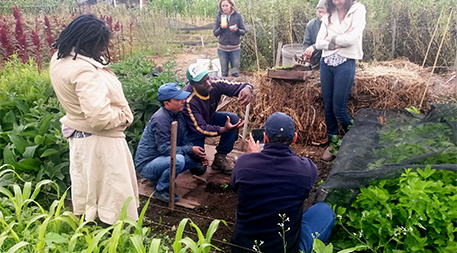 Like the soil at the farms, Jeavons’ spirit is constantly renewed by the interns who have come and gone, scattering the seeds of biointensive knowledge to small-scale farmers around the globe. He learned biointensive methods from British horticulturist Alan Chadwick — and notes that they were used for centuries in China, Japan, Korea, Greece, Guatemala, the Philippines and Iran. His mission is to bring them back to the world, which he’s done by establishing the intern program, writing a book and leading multi-day “Grow Biointensive” mini-farm workshops that have been completed by more than 2,000 people. 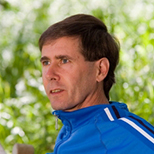 “With biointensive, we could sustainably produce food for everyone on Earth and still leave half of the farmable soil untouched.” — John Jeavons Ecology Action is increasingly using the internet to spread information, with numerous free and low-cost videos, webinars and instructional materials in multiple languages at its website and educational portal, plus a growing presence on social media. But the heart of its efforts to plant the seeds of sustainable farming on every continent is still found at the mini-farms in the big-hearted zeal of the interns. Is this not pure and simple organic farming as we know it? Great piece of writing Bob! You such a great writer showing how Biointensive Agriculture is the way to building the soil and allievating World hunger when embrace by all. I give Kudos to the Interns and Farm Owners who allowed the development of Organic Agriculture without barriers! Definitely, working together as 'one ' either from the North or South of the Globe will make food available throughout the world! I am most surprised to read that double digging is part of the activity - for two reasons. 1) Double digging brings up the poorer soil from below and essentially buries the good quality top soil. 2) If a good layer of compost is used regularly this only needs to be lightly forked in and much of the benefit will be lost if it is double dug. In fact planting directly into the compost is the best method. 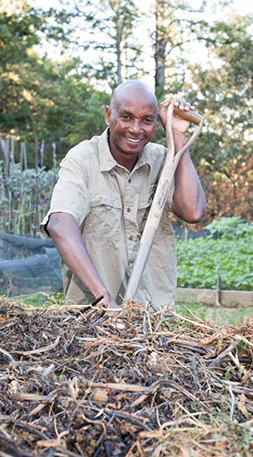 No-dig farming and gardening is very effective since it works the way nature does. 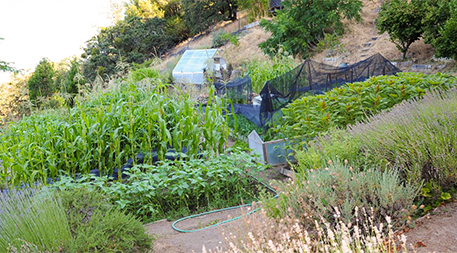 Hi Walter - while biointensive is organic, not all organic gardening is biointensive. There are particular attributes of biointensive gardening that make it more productive and more useful. Much organic farming/gardening relies on imported inputs whereas biointensive is attempting to develop a closed loop system. The biointensive seed raising and planting techniques are quite innovative. Hi Vernoica - no dig gardening can work, but it depends on the depth of soil. Double digging does not bring up poorer soil from below as the bottom layer is only loosened not brought to the top. I used to be a no dig gardener (lots of mulch and compost) but I discovered under the mulch soil that was not improving. A anaerobic clayey soil will not improve using no dig - as the lower levels of soil require air spaces for the microbes (and worms etc) to work. The principle behind double digging is to develop deep soil structure - if you already have that then you can count your blessings! I have also seen some poor examples of double digging. John Jeavons and co have a very detailed process for double digging that is worth trying. I have found rapid productivity improvements from double digging and a much better soil structure. But I am careful not to bring up poor soil from underneath and not maintain the soil layers. The use of compost is a critical aspect of biointensive - and correctly made compost is a real art that I am just finding out after 30 years of composting. No dig gardening is a bit like the way nature works, but nature takes a long time to build topsoil. Biointensive can reduce that time significantly and build beautiful soil and create productive gardens. It's worth investigating. Please read the link below. Double digging is not what you describe. For over 26 years my 5 acre farm has applied the principles of biointensive gardening with absolute positive results. The only addition was to create trenches around all beds so that flooding events will do no harm. Last year won the 2015 Blue Legacy Award for Water Conservation as a Producer used only 5200 gallons for the farm. About 30 years ago there was a group called Ecology Action, a mmembership-based co-op that had been around for a while to facilitate recycling. We had to pay a fee and then sort everything into the large piles at the site: green glass, brown glass, plastic by number, etc. It persisted for years until the municipal government finally started a recycling system. It was a very determined effort that eventually led to the current one container, mixed recyclables, curbside pickup system. The logo looks the same but the website does other mention ever having been involved with recycling. It is wonderful to read these models of biointensive farming. Thanks for sharing. Thank you Peter for your explanation to Veronica. I found it very informative and you answered some of my long held questions.